The search giant wants to help you find what you’re looking for, faster, by mapping every person, place, and thing on the planet. Bing and Yahoo both announced innovations in search earlier this year, and Google doesn’t intend to get left behind. Recently, the company has started talking about its “Knowledge Graph,” a giant database that aims to collect information about every concrete thing in the world (they’ve compiled 500 million so far), which they say will help them provide better search results. Their first stab at creating the Knowledge Graph product is the panel that now shows up on the right side of search pages, with encyclopedia-style nuggets of information about the thing you were searching for. 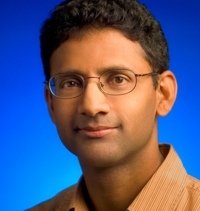 Fast Company recently spoke with Ben Gomes (pictured, right), a Google Distinguished Engineer who leads the company’s engineering efforts on search, to learn more about where Google is headed with the Knowledge Graph and what it hopes to achieve. Bing’s innovations, which involve embedding widgets in search, like an Open Table reservation system, are about turning search into an app, that lets you do things, rather than just find information. Yahoo’s innovation is about providing images of search result pages to help you navigate more quickly to the page you want to read. Gomes says Google’s innovations, on the other hand, are about helping users perform better searches by, first, helping them quickly let Google know which specific thing they’re looking for and then by helping them dive deeper into a topic of interest. 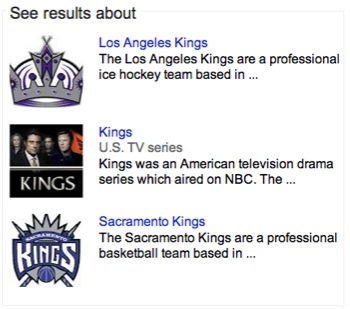 If you enter “kings” into Google’s search box, for example, the right side of the results will display three panels–one for the Los Angeles Kings hockey team, one for Kings, the short-lived NBC drama, and one for the Sacramento Kings basketball team (see image, left). “Now that we know about this variety of different real-world things, we can allow you to disambiguate which meaning you intended,” Gomes says. The more detailed panels that Google provides serve, Gomes says, as the “scaffolding” that allows you to explore further into your chosen topic. If you choose the Kings TV show, for example, the panel displays the name of the program creator, images of the cast, and related shows people tend to search for–any of which is clickable. “It’s providing pathways for exploring the web,” Gomes says. The panels are created dynamically based on what Google thinks searchers will find most relevant. So, for example, if you enter “Florence and the Machine,” the panel will show things like the group’s labels, top songs, and top albums. 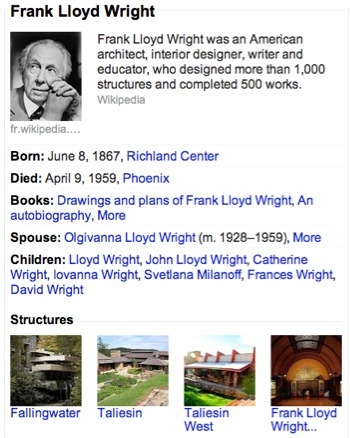 But if you search for “Frank Lloyd Wright,” the panel displays the architect’s date of birth and date of death, the names of his spouse and children, and the top buildings he created (see image, right). “We show you the information people are most interested in,” Gomes says. The system is able to figure that out, on the fly, because it has access to users’ search activity. 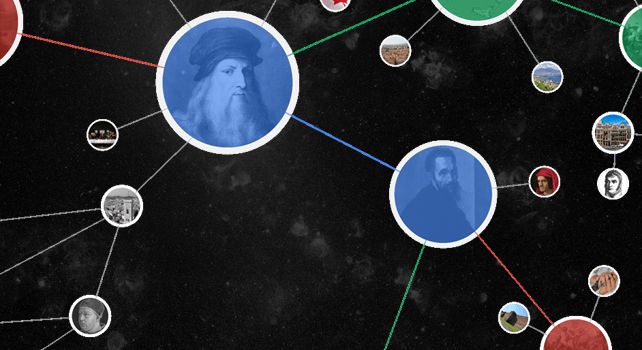 The things that people search for the most are prioritized more highly in the Knowledge Graph. So, for example, if all of a sudden searchers started looking for information on Lloyd Wright’s favorite foods, it’s conceivable that the panel would start displaying details about those foods, rather information about his children. “Because we know what people are searching for, we know what matters,” Gomes says. The better the Google search experience, the more users will choose Google over its competitors. And since the overwhelming majority of Google’s revenues come from ads displayed next to search results, the company is highly motivated to ensure that users keep coming back. While the new panels are Google’s first step into using its massive database to improve the search experience, Gomes declines to divulge much detail about what lies down the road. He also seems to indicate the company might not even have a hard and fast road map planned out. “You take these things one step at a time,” he says. “There will be things that will become possible that we haven’t even thought of. More immediately, however, the company plans to expand the types of things that get a panel. Most of the time you search for a famous person, a panel will appear. But search for something like “philosophy,” however, and, right now, space is blank. The company is also exploring how it can use the information being gathered in the Knowledge Graph in other ways, developing new experiences for the mobile phone and other platforms. Google Now, the smartphone personal assistant that competes with Apple’s Siri and that they company launched at Google I/O last month, for example, draws in part on the Knowledge Graph.